Article: The Many Languages of Transit Platform Signs – CityLab. I’ll stipulate right up front that including the NYCTA in this is silly. 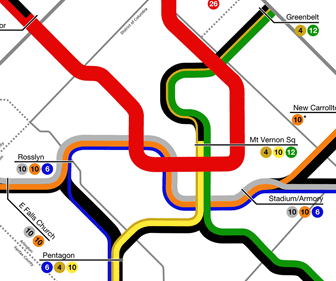 Four hundred and sixty-eight stations on ten lines served by 24 different services is seriously different from any other rapid transit system in the USA. So just ignore it. On the subject of WMATA’s DC Metro (which at least has different services running along the same lines going to different termini) I really don’t understand the move towards directional signage. As the article says, their system isn’t cartesian, it’s more like spaghetti; what does “westbound” even mean? And when you’re in DC’s CBD, you’re underground anyway. Seems to me that pointing to a service’s terminal is the simplest way. If a passenger is trying to navigate, they can see where they have to get off (Quincy Center, say) by comparing where they are (Harvard Square) to where they need to be and then following that line to its end to see which direction they need to go based on the terminal. Yes, this assumes a line chart or map in the station but you have to give a few hints. So you go to the platform marked “To Braintree” and get on a train that goes to the same place (not on one marked Ashmont!). Sometimes not enough attention is paid to wayfinding but I don’t see how moving from terminal names to directions is going to help.